There’s no two ways about it: emailing while driving is extremely dangerous. But for many people, going off the grid for the duration of a long drive is more alone time than they can handle. If you are one of the text addicts, then check out Textn’Drive, a mobile app that reads incoming emails aloud to you so you can keep your hands on the wheel and your eyes on the road. While it sounds like it might provide hands-free texting, currently, Textn’Drive actually focuses on email, although support for texts is on the way. Just download the free app (available for iPhone and BlackBerry with Android coming soon) and input your email account information. All email providers are supported, with easy setup for Gmail, Hotmail, AOL and MobileMe. Turn the app on when you get behind the wheel. From then on, whenever you receive an email, the message will be read aloud to you. The premium version of the app allows you to respond to the email by saying “reply” when prompted. Simply speak the message you would like to send, and Textn’Drive will transcribe and deliver it (the upgrade costs $9.99). Is Text'nDrive Pro worth paying a premium? Well, if you avoid even one traffic citation for "texting while driving," you'd probably come out way ahead. No to mention that If the app keeps you from having a bad accident while you're distracted by your iPhone, then it's certainly worth the investment. 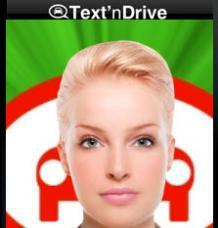 You can speak up for safety with Text'nDrive.